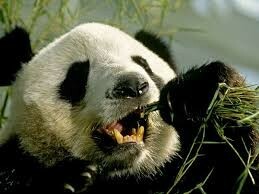 You may say that pandas just eat all day and are lazy.......well then your right! Pandas spend up to twelve hours a day eating, and they eat as much as 85 pounds of bamboo every day. When they eat the bamboo they end up spreading seeds all around allowing more bamboo to grow. 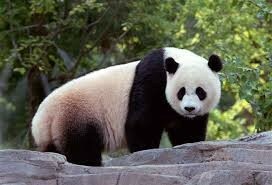 The giant pandas are native to central China, where the bamboo grows and are related to the bear family. But unlike bears the only food the giant pandas eat is bamboo. Did you know that bamboo is part of the reason pandas are endangered? As many as half the 1,200 woody bamboo species are in danger of extinction. Each individual piece of bamboo grows one flower, then when the bamboo dies 20-100 years later the whole stick of bamboo is gone. That's not the only reason it is dying, lots of bamboo forests are being cut down for firewood and farm land. Many animals depend on bamboo for food and shelter. As an example about fifteen different species of birds live in bamboo. Bamboo is not only used for animal food and shelter it is also used for materials we use. Millions of people depend on bamboo for food, construction material, furniture, and even musical instruments. 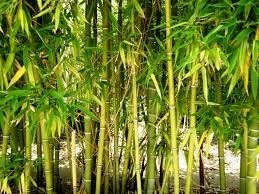 Bamboo is also used in making acupuncture needles, flooring, firewood and paper. Now that you how many things bamboo is used for you can understand how much it is worth. The trade in bamboo is worth as much as the trade of bananas, or American beef. With all this high demand for bamboo form people you can understand why the decrease in bamboo is not good for people or animals. Did you know that there are less then 1,600 pandas left in the wild? This is because of many reasons, one of which is the decrease in bamboo. The pandas eat bamboo all day and if there is not enough bamboo to eat the pandas starve, and that can lead to extinction. Another reason they are endangered is because of poaching. 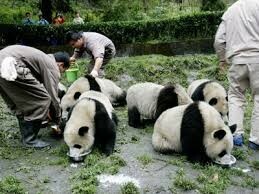 When people started poaching pandas there population went down. Since then they made laws about not poaching. Unfortunately pandas are accidentally being shot by hunters who are hunting in the bamboo forests. Yet another reason they are becoming endangered is because of railroads. In China they are building rail roads and road in forests were pandas live, because of this the panda population is being isolated and that prevents mating. If they can't reproduce there population will drop drastically. Ever since the pandas became endangered the Chinese government has tried to help. The government established more than fifty panda reserves, they hold 61% of the giant panda population. The Chinese government also banned logging in bamboo forests to save the bamboo for the pandas. Pandas aren't just in panda reserves but they are in zoo's too. There are over 300 pandas in zoos all around the world. In these zoo's they try to help the pandas reproduce my getting some to mate. These are all way the pandas are being helped to make sure they don't go extinct. Poaching: To illegally hunt or catch animals that are officially protected or one someones land that you are not permitted to be on. Endangered: When an animal is in danger of extinction. Logging: When people cut down trees (or bamboo).